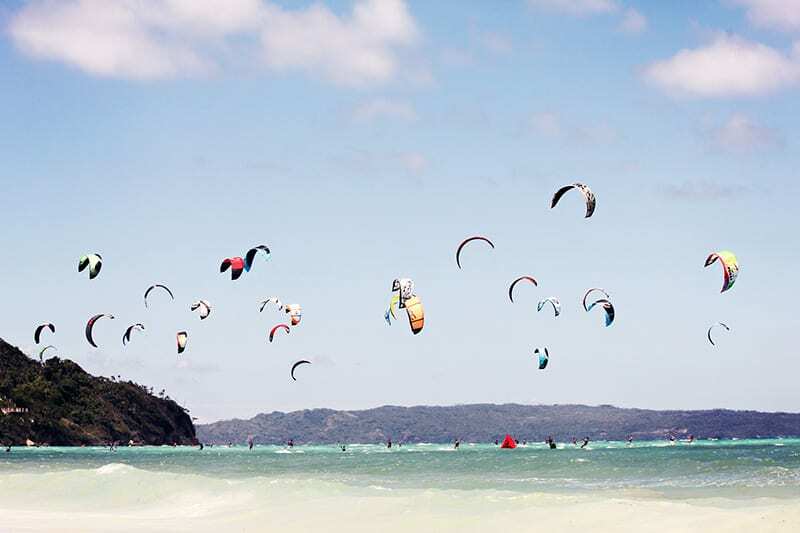 Kiteboarding fun in Boracay, Phillipines. Photo credit: Anastasia Zhebyuk. Last month we discussed one of the most important self-survival tools of kiteboarding, body dragging. As a quick refresher, body dragging is the process of using the kite to propel you through the water without use of a kiteboard. This can be used for board recovery or for returning to the beach if your board is lost or you are injured. Now that we have that down, it’s time to ride! The first step is putting the board on your feet. This can be more difficult than expected. I will write the steps using the left hand to hold the board and the right hand to fly the kite. The same can be done with the right hand holding the board by mirroring this process. Step one: Maneuver the kite the 11:45 position and square your body/stance in-line with the kite’s pull. You will be facing slightly left of straight downwind. Step two: Lay back in the water with both feet floating and place the right foot into the corresponding strap of the kiteboard. Step three: Pull your left foot up and let the kite pull it into the strap. Now that you are in the board, it’s time to get square with your direction of travel. For example, if you are going to travel right, dig the right side of the board into the water until you spin to the right and your sternum is pointing half way between straight downwind and the right edge of the wind window. Now that you are in your board and square, it’s time to ride. Since we are going right, you will start with small but aggressive power strokes placed in a figure-eight pattern. As you get more and more aggressive with the kite, dig your board deeper into the water to create traction. This “traction” will give you leverage against the kite and the kite will pull you upward by your harness. Wow!! You just popped up on the board, but you are now probably face down on the water. Hopefully you are still smiling because there is a lot of details to this first ride that you still need to learn to keep yourself on top of the water. Next month we will refine this “power stroke” as well as your body position/stance to help you stay riding once you stand up. I can’t stress enough that kiteboarding should never be attempted without professional instruction. These articles are simply to help you prepare for your lessons and educate those who are curious about the learning process. Thanks for supporting this series and I look forward to sharing more with you next month.